Paris COP21: Small islands are hoping for a climate miracle. 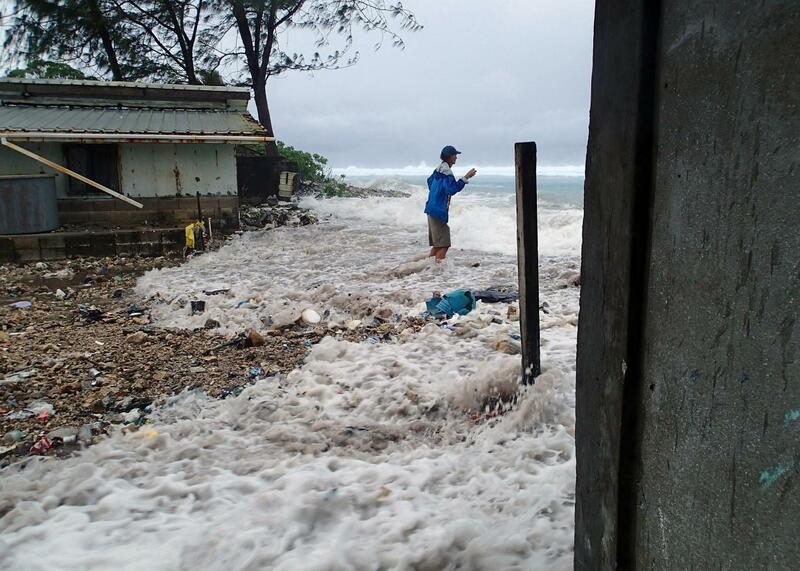 A resident of the Marshall Islands is surrounded by the on-rushing high tide energized by a storm surge that damaged a number of homes across Majuro on March 3, 2014. Line-by-line negotiations are now underway in Paris, and the emerging divides could define the ultimate character of the first-ever global agreement on climate change, widely expected by the end of next week. Raising the biggest ruckus so far, understandably, are the dozens of countries at greatest risk. Early on, small islands and other front-line countries have doubled down on basically an unattainable goal, and it’s clear that they’re not backing down. As the Washington Post’s Chris Mooney wrote Tuesday, a group of 39 countries—the Alliance of Small Island States—forms the “moral center” of these talks. It’s hard to argue with that characterization, since, remember, these are independent nations that may be literally wiped off the face of the Earth by sea-level rise in just decades. President Obama stood beside the leaders of these countries on Tuesday and pledged his support, declaring, “I’m an island boy,” in reference to his years in Hawaii and Indonesia. But as global emissions have continued ever upward over the last several years, it’s become increasingly unlikely—and quite honestly, probably impossible—that these countries will exist in their current form a century from now. As Tony de Brum, the foreign minister of the Marshall Islands, said recently, the current pathway is “condemning the small island states to oblivion.” The New York Times launched a feature on him and his country on Wednesday. Climate science has grown clearer that even the internationally agreed-upon goal of limiting warming to less than 2 degrees Celsius—the basis for the Paris talks—probably won’t be enough to prevent widespread catastrophe. That goal has been criticized by many scientists in the runup to Paris, most notably because virtually all potential scenarios that achieve it require creative accounting and reliance on unproven “negative emissions” technologies. In an essay this week, climate scientist Kevin Anderson warned that scientists and world leaders are engaging in “dangerously misleading optimism” when they claim current actions are a pathway to meeting the 2C goal. And, besides, we’re already halfway there: In just the last few months, we’ve reached a full 1 degree Celsius above pre-industrial levels. Since there’s a 40-year lag between emissions and the atmosphere’s temperature response, even if the entire world permanently stopped all emissions overnight, we’re still on the hook for an additional 0.6 degrees by the end of the century. Despite this cruel math, a separate negotiating group of 20 countries—the Climate Vulnerable Forum, which includes several small island states, as well as larger countries like Ethiopia and Bangladesh—renewed its call at Paris for an even tougher goal: 1.5C instead of 2C. The group even debuted a new hand signal with which delegates can communicate their support. One other Caribbean country, Nicaragua, has refused to participate in the international process altogether out of protest. It’s noble that these countries are bringing everything they have to the negotiating table, where consensus among all nations is required for any binding agreement. But a call for a 1.5C temperature target is Sisyphean in its ambition at this point. It just isn’t possible. Still, the always optimistic leader of the talks, Costa Rican Christiana Figueres, applauded the tougher goal. That extra half-degree may not seem like much, but it essentially means the small negotiating bloc is really demanding a time machine. Such a temperature target is probably literally impossible without a simultaneous crash carbon diet (the Climate Vulnerable Forum asks for roughly 50 percent reductions, globally, within the next 15 years, even though it’s likely emissions will still be rising by then) and rapid deployment of carbon sucking technology that hasn’t yet been demonstrated at any meaningful scale. Instead, as these negotiations advance, these countries should consider scrapping their call for 1.5 degrees and go all-in instead on financial and technical support for the permanent “loss and damage”—loss of coral reefs, ocean acidification, inundation—that climate change is set to cause, in addition to the already agreed-upon pledge of $100 billion of broader climate aid per year by 2020. In a Wednesday press conference, lead U.S. negotiator Todd Stern declared his tentative support for this idea, though he didn’t go as far as pledging additional support. With a little more pressure, it’s conceivable the U.S. may bend further to the island countries’ demands. That’s a better outcome than winning on a formal declaration of support for 1.5 degrees, which is little more than a dream. Money is no substitute for the preservation of a homeland that’s been culturally rich and prosperous for generations. But, sadly, it may be the only thing worth fighting for at this point.